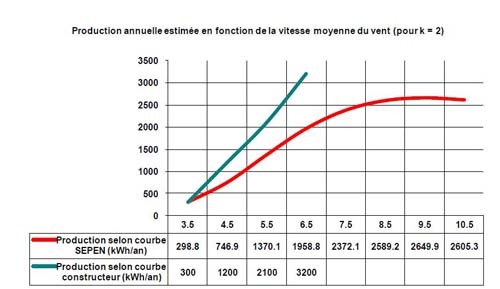 The French test site, SEPEN (Site Expérimental pour le Petit Eolien de Narbonne), published a performance report 28 September 2009 on Mariah's 1.2 kW Windspire. The test site is in a windy region in the south of France. The 54 page report (in French) is another in a series of reports on the performance of the novel VAWT. The test results failed to confirm measurements by Windward Engineering in Utah says SEPEN. At 10 m/s SEPEN measured 675 W, whereas data from Windward's tests showed 800 W.
SEPEN acknowledges that the test site is extremely turbulent, but argues that this is representative of the type of sites where Mariah's Windspire would be used. Mariah has installed several of the slender VAWTs in the USA near buildings and trees all of which cause severe turbulence. Similarly, SEPEN reports that their measurements fall below the performance projected by the manufacturer of 1,200 W at 11 m/s. SEPEN measured 986 W at 11.4 m/s. Based on its measured performance, SEPEN estimates that Mariah's Windspire will produce only two-thirds the energy advertised by the manufacturer (1,370 kWh/yr compared to 2,100 kWh/yr) at an average wind speed of 5.5 m/s. The green line is Mariah's published estimate of AEO. The red line is SEPEN's estimate of AEO based on measured performance.